In 1915 the declining Ottoman Empire carried out a genocide against its Armenian population. The intention to eliminate Armenians was explicitly stated in a document issued by Ottoman rulers in the Committee of Union and Progress. With World War I taking place, the genocide could be readily justified as a national security measure. The genocide began by targeting elites in major cities and removing battle-age males by conscripting them into the Ottoman army. Armenians were systematically deported from their towns and would either be killed in large-scale massacres or die during transport (Jones, 149-161). That is a linguistic description of the Armenian genocide. In this paper, I will focus on visual representations of the Armenian genocide, in particular, maps. Maps are a powerful means of representing genocide that enable us to comprehend the totality of a genocide as a spatiotemporal process. Since language comes in discrete chunks (letters, words, sentences, etc. ), there is no possibility of directly extracting more information after we have parsed each component. Second, consider the way in which language and images achieve representation. Language achieves representation through an arbitrary association between symbols and that which they represent. For example, the English word ‘dog’ could just as well be used to denote cats. Images, on the other hand, achieve representation through a structural similarity which that which they represent. For example, a drawing of Berkey Hall must be such that the lines in the drawing correspond to architectural features of the building, and the lines must be related to each other analogously to the way the corresponding architectural features of the building are related to each other. Thus, when we view an image we perceive some aspect of the structure of that which the image represents. In some sense, a “map is actually a diminutive reproduction of the real space to which it refers” (Robinson and Petchenik, 86). Next, consider the role of choice when representing with language and various types of image. Language offers its users great freedom in the choice of which concepts to employ when representing. For example, ‘a dog ran across the yard’ and ‘a mammal moved across the yard’ could both represent the same event even though the first sentence uses more specific concepts than the second. Language requires that we break up the world into categories. A way of breaking up the world into categories may obscure certain features of the world or privilege certain interests over others. Certain types of image lack the conceptual freedom of language. An undoctored photograph, for example, leaves little choice to the photographer after it has been decided where the camera should be aimed. Ideally, a photograph presents uninterpreted visual data about a scene as it would appear to a human eye situated there. This point has been disputed by a colleague. I do not wish to argue that a photograph has no ideological content, but I do maintain that representations can be arranged into a spectrum according to how much ideological content is imposed upon them by their authors and that photographs have less ideological content than language. The freedom of a mapmaker lies somewhere between that of a language user and a photographer. Similar to the language user, the mapmaker can choose which concepts to use in the creation of a map. A map might display population density, temperature, locations of mass shootings, or anything else the mapmaker can dream of. But once the data to be displayed on a map and an appropriate means of displaying it are chosen, the mapmaker is constrained to create the map a particular way. As we will see in the next section, however, the choice of a means of displaying the data can lead to great differences in the map produced. The map itself has a history. The earliest version of the map was created by the Armenian National Delegation and appeared at the Versailles Peace Conference of 1920. Mgr. Jean Naslian, a survivor of the genocide and Catholic bishop of Trebizond, modified the map and republished it in 1951. Most appearances of the map unfortunately do not include information about their ancestry, but there are a few instances of cartographic genealogy. Figure 1 originates from a version appearing in the Soviet Armenian Encyclopedia, but was modified with information from Gérard Dédéyan’s Histoire des Arméniens (1982) and the work of Naslian (Hewsen, 232). Figure 4 is a “clone” of Figure 1. All the maps of the Armenian Genocide I have encountered are uniform in two respects. First, circles are used to represent locations where Armenians were killed, the magnitude of the circle proportional to the number of deaths. The circles are almost always red, the color of blood. Second, directed curves are used to represent deportation routes. It is this uniformity that enables us to speak of one map-type with many instances. Beyond this uniformity, the maps differ from each other in interesting ways. According to the legends accompanying the maps, red circles can denote either “massacre sites,” “deportation control centers,” or combined “centers of massacre and deportation.” In at least one instance, the label is clearly wrong. Figure 5, from <armenica.org>, claims that a red circle denotes a “deportation control centre,” but includes red circles located far into the Black Sea. Some Armenians, particularly women and children, were loaded onto boats so that they could be thrown overboard or have their boats capsized in the Red Sea, but there were no aquatic deportation control centers. While Figure 6 does not make the mistake of indicating deportation control centers in the Black Sea, it does share the error with Figure 5 of claiming that all red circles represent deportation control centers. Figure 1 carefully marks deportation control centers as red circles surrounded by a black ring, and relatively few of these appear on the map, as one might expect for a deportation control center. Notice that maps differ in the range of sizes used for circles. Since the size is supposed to represent the relative number of Armenians killed, any range of sizes can be used as long as the circles are scaled appropriately. Maps using larger circles are more dramatic, since these maps seem to represent more of the land being engulfed in death. 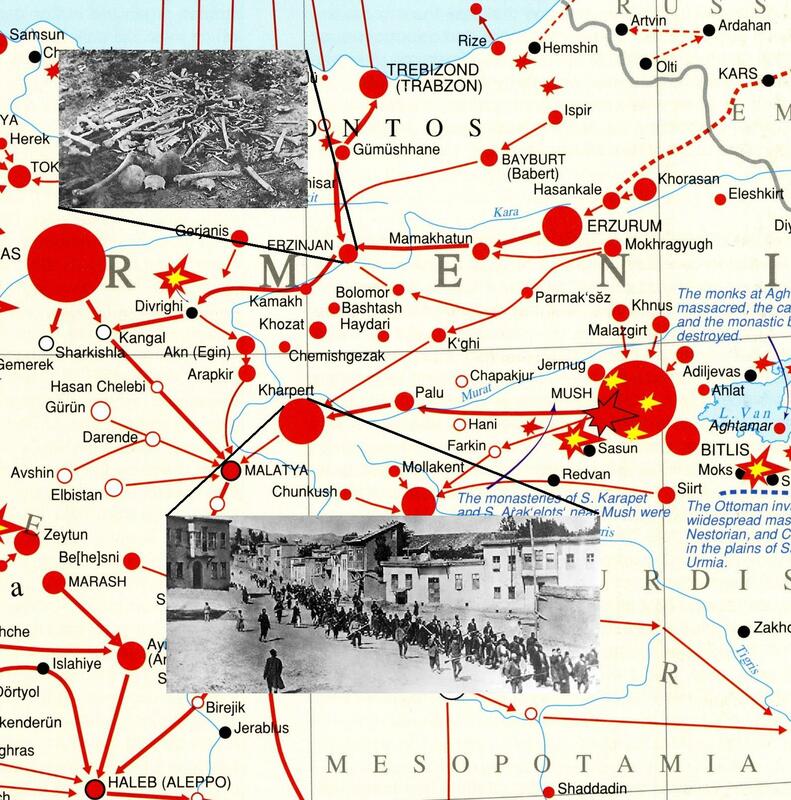 For example, the maps of a hypothetical genocide in Figure 7 each represent the same data according to the scheme used in the maps of the Armenian Genocide. Each map contains four circles centered at the same four points, and in each map one of the circles has twice as large a radius as the other three circles. However, map B seems to represent a more severe genocide because the absolute size of the circles is greater. It is my impression that Figures 2 and 3, because they use larger circles than the other maps, make the Armenian Genocide look more severe than the other maps do. None of the maps say what number of deaths each circle represents, but this would be unlikely to help. Most humans have a poor number sense and would be more influenced by the crowdedness of red circles on the map. I claimed above that when a circle appears at a location, the size of the circle represents the number of Armenians killed there. This is not completely true. Each map uses only a finite number of circle sizes, and the notion of proportionality only makes sense when continuously varying quantities are involved. Because the circle sizes vary discretely rather than continuously, the mapmaker must choose cutoff points for the number of deaths corresponding to each circle size. Figure 8 shows explicitly the result of two different choices of cutoff points. Some of the maps of the Armenian Genocide are either drawn from different data or use different cutoff points. 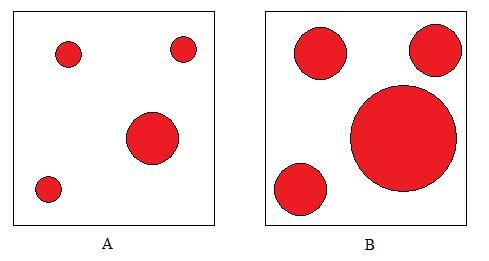 For example, Figure 6 has only one instance of the largest circle size, whereas all the other maps have at least two instances of the largest circle size. One reason we might turn to maps as a representation of genocide is that we think of maps as an objective display of information. Maps represent genocide in a mathematical way that is not vulnerable to the same skepticism with which we might confront a narrative presentation of genocide. I hope the previous section has cast doubt on this view. Making a map of genocide involves a great degree of choice concerning which data to display and how to display it. These choices give the map creator great control over the effect the map has on its viewer. But if not in objectivity, where lies the value of maps as a representation of genocide? What do maps teach us about genocide that other modes of representation do not? A map enables a human to hold in its consciousness all at once a representation of the totality of a genocide. A genocide is a very complex chain of events, but this complexity can be quickly comprehended if it is displayed visually. Interestingly, Cooper’s book titled The Geography of Genocide contains not a single map. The map of the Armenian genocide represents population flows, so it also has a temporal dimension. Thus, it can help us see the genocide as a process that evolves in spacetime. Cause and effect relationships are one aspect of a genocide that can be revealed by a spatiotemporal representation. (Or, if cause and effect is too rigid a notion, it at least displays the influence that events have on one another.) A map can show us how a genocide is organized, whether it is controlled from the top down or is an emergent phenomenon resulting from the sum of small-scale activity that, while not unrelated, has no direct connection. Hopefully maps and visual representations generally will come to be seen as an important tool for understanding genocide. Cooper, Allan D. 2009. The Geography of Genocide. Lanham: University Press of America. Hewsen, Robert H. 2000. Armenia: A Historical Atlas. Chicago: The University of Chicago Press. Jones, Adam. 2006. Genocide: A Comprehensive Introduction (Second Edition). London: Routledge. Monmonier, Mark. 1993. Mapping It Out. Chicago: The University of Chicago Press. Robinson, Arthur H. and Barbara Bartz Petchenik. 1976. The Nature of Maps. Chicago: The University of Chicago Press.